Windsor Spine & Sports Therapy carries a variety of braces to treat acute or chronic injuries of the ankle, knee, wrist, elbow, back and neck. Certified fitters are on staff. Not all braces are designed equally and Windsor Spine & Sport Therapy fitters know how to fit you with the best brace to suit your needs. Braces can be used for compression and comfort, to restore function of joints, to improve functionality, and to prevent and treat sports injury. Windsor Spine & Sports Therapy is the only clinic in Windsor and Essex County with exclusive rights to carrying the “Push” line; beautifully designed sports and medical braces designed and manufactured in Holland. Push is constantly searching for the best solution to increase the ability of joints to deal with stress load. All their braces are subjected to thorough and lengthy tests, materials and shapes have been researched and their designs carefully considered. Another line at Windsor Spine & Sports Therapy is “Bauerfeind”. Designed and manufactured in Germany, Bauerfeind is the official supplier to the German Olympic teams since 2001 and a dedicated supplier of many international teams for decades. Bauerfeind teams are on hand to support the athletes throughout the Olympic Games including Vancouver’s 2010 winter games. Established in Germany in 1929, Bauerfeind is one of the leading manufacturers of medical products including supports, orthoses, medical compression stockings and orthopedic orthoses. Specifically designed to provide a high level of comfort and support, let Windsor Spine & Sport Therapy provide you with what the champions wear. When it comes your skin, the most comfortable braces to wear are M-Brace supports and braces. Windsor Spine & Sports Therapy carries a full line of M-Brace, designed and manufactured in Italy; it has been the brace of choice for anyone who struggles with sensitive skin or skin allergies. 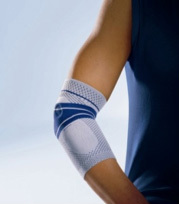 There is no other brace on the market that offers M-Brace’s superior comfort and support. Windsor Spine & Sports Therapy is constantly seeking out the best braces and stays on top of the latest research. Along with our full lines of Push, Bauerfeind and M-Brace, we also measure and provide custom knee braces, carry the best of Bio-Skin, DJO Ortho, Breg, Mueller, Band-It and much more. Make sure you stop by to see what we have when you need a support or brace. No appointment is necessary, the staff is happy to help you when you are available. © Copyright 2012. Windsor Spine & Sports Therapy. All Rights Reserved.